At 11 am, as Congress unveiled a statue honoring Rosa Parks, the civil rights leaders of today (Including Rep. John Lewis, who nearly died in Selma during "Bloody Sunday") were gathered inside the Supreme Court, listening to a challenge to the centerpiece of the Voting Rights Act. The stark contrast illustrated the profound contradictions of American democracy when it comes to race and political power—the progress we’ve made has always been met by equally intense efforts to roll back that progress. And that remains true today, especially on February 27, 2013. “To honor Rosa Parks in the fullest manner, each of us must do our part to protect that which has been gained, defend the great documents upon which those gains were obtained and continue our pursuit of a more perfect union,” Congressman James Clyburn, who grew up in segregated South Carolina in the 1940s and ’50s, said at the statue unveiling. 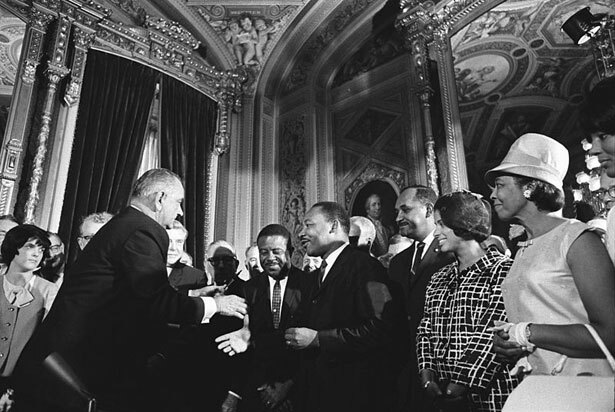 Parks herself was present when Lyndon Johnson signed the Voting Rights Act in the Capitol rotunda on August 6, 1965. Twelve years before famously refusing to move to the back of a segregated bus in Montgomery, Parks attempted to register to vote. She was denied three times, and had to pass a literacy test and pay a poll tax in 1945 just to exercise what should have been her fundamental right. That’s the way America was before the passage of the Voting Rights Act. It quickly became clear inside the courtroom that there are four votes to uphold Section 5 and four votes to strike it down. Justice Kennedy, as is so often the case, appears to be the swing vote, although he certainly leaned toward the conservatives. Justice Kennedy seemed preoccupied by two questions: number one, does Section 5 still cover the states and localities where discrimination is most concentrated in order to justify its federalism constraints? And number two, are other parts of the Voting Rights Act, most notably Section 2, an adequate replacement for Section 5? JUSTICE KENNEDY: if Congress is going to single out separate States by name, it should do it by name. If not, it should use criteria that are relevant to the existing [problem] — and Congress just didn’t have the time or the energy to do this; it just reenacted it. VERRILLI: I think it was rational and effective in 1965. The Court upheld it then, it upheld it three more times after that. JUSTICE KENNEDY: Well, the Marshall Plan was very good, too, the Morale Act, the Northwest Ordinance, but times change. VERRILLI: But the question is whether times had changed enough and whether the differential between the covered jurisdictions and the rest of the country had changed enough that Congress could confidently make the judgment that this was no longer needed. Verrilli and Adegbile described Section 2 as a poor substitute for Section 5. As Kennedy himself noted in 2009, “Section 2 cases are very expensive. They are very long. They are very inefficient.” Section 2 lawsuits are incredibly complex, can take years to adjudicate and often cost millions of dollars, which few victims of voting discrimination can afford. Congress included Section 5 in the Voting Rights Act precisely because case-by-case litigation had failed to stop voting discrimination prior to 1965. “The reason Section 5 was created was because States were moving faster than litigation permitted to catch the new forms of discriminatory practices that were being developed,” said Justice Sotomayor. The genius of Section 5 was to “shift the advantage of time and inertia from the perpetrators of the evil to its victims,” Chief Justice Earl Warren wrote in the 1966 case South Carolina v. Katzenbach, the first of five unsuccessful challenges to Section 5. In last year’s election cycle, the Justice Department under Section 5 opposed voter ID laws in Texas and South Carolina, early-voting cutbacks in Florida and redistricting maps in Texas. The federal courts in Washington sided with the DOJ in three of four cases, finding evidence of discriminatory effect and/or purpose, while also blocking South Carolina’s voter ID law for 2012. If Section 5 was gone and Section 2 was the only recourse, these major changes would’ve been in effect during the last election, and could only be challenged after years of costly and difficult litigation. The voters disenfranchised in the meantime would have no recourse, other than the hopes of a preliminary injunction from the courts, which is an increasingly rare prospect in a judiciary dominated by conservatives, especially in the South. Amazingly, the voter suppression attempts that spread nationwide during the last election never came up during the oral arguments. The justices did not hear, for example, that six of the nine fully covered states under Section 5 passed new voting restrictions since 2010, including voter ID laws (Alabama, Mississippi, South Carolina, Texas and Virginia), limits on early voting (Georgia) and restrictions on voter registration (Alabama and Texas), compared to only one-third of noncovered jurisdictions during the same period. The insularity of the Supreme Court was particularly evident today. Opponents of Section 5 pointed to the fact that minority voter registration and turnout rates in places like Alabama are equal to or exceed states not covered by Section 5, but that hardly covers the scope of voting discrimination that exists in the South today. CHIEF JUSTICE ROBERTS: General, is it the government’s submission that the citizens in the South are more racist than citizens in the North? CHIEF JUSTICE ROBERTS: Well, once you said it is not, and you don’t know the answer to it. GENERAL VERRILLI: It’s not our submission. As an objective matter, I don’t know the answer to that question. But what I do know is that Congress had before it evidence that there was a continuing need based on Section 5 objections, based on the purpose-based character of those objections, based on the disparate Section 2 rate, based on the persistence of polarized voting, and based on a gigantic wealth of jurisdiction-specific and anecdotal evidence, that there was a continuing need. CHIEF JUSTICE ROBERTS: A need to do what? CHIEF JUSTICE ROBERTS: And not impose it on everyone else? GENERAL VERRILLI: And—that’s right, given the differential in Section 2 litigation, there was a basis for Congress to do that. JUSTICE KAGAN: You said the problem [of voting discrimination in the South] has been solved. But who gets to make that judgment really? Is it you, is it the Court, or is it Congress? MR. REIN: Well, it is certainly not me. JUSTICE SCALIA: That’s a good answer. I was hoping you would say that. MR. REIN: But I think the question is Congress can examine it, Congress makes a record; it is up to the Court to determine whether the problem indeed has been solved and whether the new problem, if there is one. JUSTICE KAGAN: Well, that’s a big, new power that you are giving us, that we have the power now to decide whether racial discrimination has been solved? I did not think that that fell within our bailiwick. It would be a truly radical step for the Court to dismiss the repeated and overwhelming judgment of Congress by striking down Section 5. The disappearance of Section 5 would be a devastating setback for voting rights—akin to the way the Citizens United decision eviscerated campaign finance regulation—and would greenlight the kind of voter suppression attempts that proved so unpopular in 2012. It’s particularly ironic that Shelby County, Alabama, of all places, would bring this challenge to Section 5, given the recent history of discrimination in the county and state. Before local elections in 2008, the city of Calera redrew its city boundaries, eliminating the City Council’s lone majority-black district, represented by Ernest Montgomery since 2004. The city decreased the black voting-age population in Montgomery’s district from 71 percent to 30 percent by adding three overwhelmingly white subdivisions while failing to include a large surrounding black neighborhood. A day before the election, the Justice Department objected to the change. Calera could have preserved the majority-black district, the city’s demographer told Washington, but the City Council chose not to. Calera held the election in defiance of Justice Department orders, and Montgomery lost by two votes. If it hadn’t been for Section 5, there would be no black members of the city council in Calera. “Assuming I accept your premise…that some portions of the South have changed, your county pretty much hasn’t,” Justice Sotomayor told Rein.